This lithograph derives from plate 9 of William Wood's 'Views of Calcutta'. Wood's series contains 18 plates depicting the buildings along Chowringhee Road, now Jawaharlal Nehru Road, which was the main European residential area of Calcutta. Renowned for its spendid buildings (which earned Calcutta the epithet City of Palaces), at this time the area was expanding at an astonishing pace. 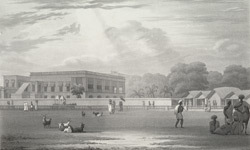 Wood had arrived in Calcutta to help his brother George run the Asiatic Lithographic Press, which was established in Park Street in the 1820s.